Professional hand made wood saw. This hand saw is excellent for use in the woods. It packs down as can be seen in the photo so it fits in your pack. The tension is applied to the blade by turning the wooden stop which brings in the frame for blade stability. This saw has won an award for its design. Please note these are hand made items so may not always be in stock. We will advise when placing an order. Post and packing is £7.50 and is added in the PayPal checkout. This “Millbank bag” is a hand made copy of the original British forces Millbank bag. This bag is brand new and made by a craftsman who specialises in bushcraft products. Used for filtering water, prior to boiling or being treated , this bag successfully filters all the detritus from the water supply. Simply soak the bag and fill up to the top. Once it drains to the line you can then collect the water. This is the Millbank bag we use on the courses when we demonstrate water purification. Full instructions are on the bag. Please be wary of Millbank bags offered for sale elsewhere as the British Army are very apt at adapt ion and they get used for filtering oil and fluids from engines and can be contaminated. Be safe and sure and buy one of these. Post and packing is £1.50 and is added in the PayPal checkout. This version of the saw above is made in Oak and has the ability to hold a blade in the handle as can be seen in the pictures. This allows a wet and dry blade to be carried. Again made to order so we will advise the delivery time. We accept international orders but please contact us before placing an order so we can give you a shipping cost. We are happy to supply to international customers. The postage shown is only UK. Please email us at les@wildcrafts.co.uk with your address and we can then give you a shipping cost. Please do not place an order until we have replied to your email.We may be running a course but will get back to you as soon as possible. 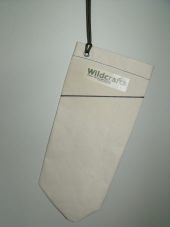 The Buck Saw Bag has been especially designed for the Wildcrafts Bushcraft Buck Saw. Post and packing is £2.50 and is added in the PayPal checkout.